eTrex 10 has an enhanced 2.2" monochrome display that’s easy to read in any lighting situation. Both durable and waterproof, eTrex 10 is built to withstand the elements. Its easy-to-use interface means you’ll spend more time enjoying the outdoors and less time searching for information. eTrex 10 features the legendary toughness that’s built to withstand the elements. Dust, dirt, humidity, water — none are a match for this navigator. Spend more time in the field and less time fumbling with paper. The eTrex stores and displays key information, including location, terrain, difficulty, hints and descriptions, which means no more manually entering coordinates and paper print outs. Simply upload the geocaching GPX file to your device and start hunting for caches. Find your way with the first consumer-grade GPS receiver that tracks both GPS and GLONASS satellites simultaneously. When using them together, the receiver has the ability to lock on to 24 more satellites than using GPS alone, giving you your position quickly. Skip the confusion about how to find things. eTrex is easy to use with intuitive navigation screens. Bring more functionality into frequently used applications with personalized dashboards. Avoid switching between applications and display more information by customizing your dashboards with an altimeter, compass, configurable data fields and more. Whether following a saved route or planning a new one, eTrex has the tracking features you need. See high and low elevation points or store waypoints along a track (start, finish and high/low altitude) to estimate time and distance between points. 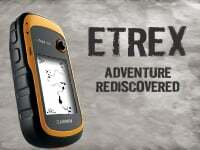 eTrex stores data in universally accepted GPX file format so its compatible with a variety of computer applications (best when used with BaseCamp™. Withstands dust, dirt, humidity and water. Locates your position quickly and precisely, and maintains it even in heavy cover and deep canyons.